As a Chicago Bears fan, the NBA season can’t start soon enough. As a Chicago Bulls fan, can’t someone unplug Derrick Rose’s microphone? More on that later. Media Day marks the start of NBA training camps, and showcases the Association in all its quirky glory. You know the NBA is back when Twitter videos pop up of a star player wearing a fannypack while lip-synching and dancing to Montell Jordan. After reading up on each team’s version of the Media Day circus, here are my winners and losers – although much like Media Day itself, this is mostly good-natured fun. Except for D-Rose (Dammit). D-Wade – You have to applaud Wade for how he’s crafted his brilliant career. He won a title with Shaq early in his career, convinced LeBron and Chris Bosh to come play with him and won two more titles, and now he’s again a cornerstone of an impressive roster. Most importantly his balky knees haven’t affected his dance moves. This is just a phenomenal performance. 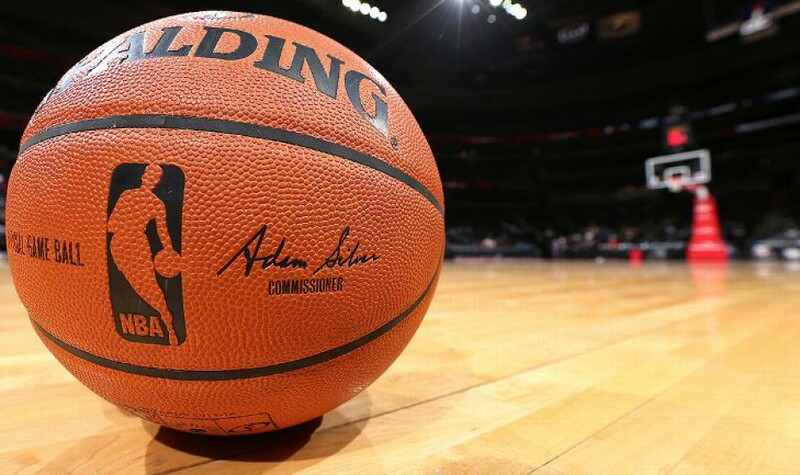 Body Image – A common theme, much mocked by the basketball internet, is the recurring training camp storyline of who’s dropped weight, added 15 pounds of muscle or gotten swole in the offseason. This year’s Media Day did not disappoint. NBA Media Day quote sheets can resemble an issue of Cosmopolitan with all the LBs shed and miracle diet plans. This year’s winners? Kyle Lowry, who struggled with injuries down the stretch and is no longer a spring chicken, is now looking “svelte” and jokes were made about the impostor wearing Kyle Lowry’s jersey at Media Day. Jared Sullinger also shed some much-needed poundage, while Rudy Gobert added muscle to help him bang down low. Danilo Gallinari is looking trim after Eurobasket. Let’s move on. Phoenix Suns – Everyone was curious how Markieff Morris would comport himself after throwing a fit when the Suns traded his brother, and demanded a trade himself. Surprisingly, he said he is putting it all behind him and looking forward to playing with his Suns teammates. This is big for Phoenix, who need Kieff’s skills and not his poor attitude in a year when they can compete for a playoff spot. Glad to see he’s on board, and it makes sense. I mean, he can still see Marcus at Thanksgiving, right? Houston Promise – Ty Lawson has spent the summer getting his personal life sorted out, and is sounding like the change of scenery is doing him some good. He’s poised to help the Rockets compete for a title and will take pressure off of James Harden, keeping the MVP candidate more fresh for a deep playoff run. 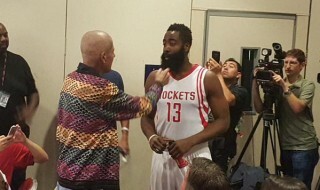 “This is like the turning point,” Lawson said at Monday’s Media Day activities in Toyota Center. “What type of career you gonna have, Ty? Are you gonna win championships or are you just be like one of the mediocre players? Alcohol is a powerful foe; I join Houston fans in rooting for Ty to defeat it. Danny Ainge responding to questions on Jared Sullinger’s weight loss, joked that he didn’t have a portable scale to weigh him. Brad Stevens when asked where the Celtics are as a team: “Somewhere in the Top 30”. The newly-svelte Lowry complained that none of his pants fit anymore. In response to the DeAndre Jordan situation, Rick Carlisle said: “If cows were kittens, there’d be a milk shortage.” I think that’s a joke, not really sure what it is. An aphorism? Anyway, I laughed. Portland GM Neil Olshey said it was “too much effort to fly to Dallas” when asked why he didn’t resign LaMarcus Aldridge. Number 1 overall pick Karl Anthony Towns started off Minnesota’s media day by announcing his retirement. That’s actually a pretty good one. Mike Malone – The new Nuggets coach sounds like he’s making an instant impact on the team, who figure to be a bottom-feeder this season. He preaches an up-tempo style, which suits the high-altitude Nuggets, and is quickly building a team identity. He doesn’t want a lot of fouls screwing up his team’s pace, stressing quick defense to offense transition. I love this Malone quote from yesterday: “Fouling negates hustle.” What a gem. Optimism – Ghandi would be proud. Optimism reigned supreme at Media Days, as it does every year. Here are some things to be happy about going into the season, NBA fans: Joakim Noah is healthy and ready to play like his old self…Fred Hoiberg loves the Bulls’ roster flexibility…Kevin Durant and new coach Billy Donovan have hit it off, are excited to work together…rookie Stanley Johnson has the Pistons glowing…star shooting guards Bradley Beal and DeMar DeRozan aren’t worried about their contracts and are just focused on winning…even George Karl and DeMarcus Cousins are (supposedly) getting along. D-Rose – I’m not going to drop a hot take here, but I’ll just say that as a longtime, staunch Rose supporter it’s getting harder and harder to defend him when he says dumb things to the media. I don’t think his talk about free agency is a huge deal but it’s definitely not a good look at this point in his career and as a leader of a team trying to fundamentally change under a new coach. This Pop Interviewer – Man this video makes you cringe. The best part is even after Pop has made it plain that he’s messing around, the interviewer looks like he’s in a Southwest Airlines “Wanna Get Away” commercial. Brutal. Brooklyn Nets – Hey Deron Williams, your former teammate Joe Johnson is confused why you wanted to leave the Nets so bad? “It’s not that bad here,” Johnson said. That should be plastered onto the outside of the Barclays Center. New Orleans Pelicans – Things on the whole are looking up with a young beast in Anthony Davis and new coach Alvin Gentry. However, Gentry said at Media Day that Tyreke Evans is their undisputed point guard. On its face, I question this strategy. Less Evans dribbling, not more, would be my prescription for the Pelicans. The more foreboding news reading between the lines here is that Jrue Holiday must not be ready to come back and be a reliable contributor, let alone the main point guard. Jeremy Lamb – In his first season as a Hornet, Lamb is setting himself up to learn some harsh realities. Here’s what he said at Media Day: “I like to shoot the ball but I also like to make plays for my teammates. I think it’ll open up things for Big Al but also he can kick out if they double team him…[I] like to help people play to their strengths.” Obviously Lamb, only 23, is still learning the League. Double team or not, Al Jefferson doesn’t kick it out, young’n. 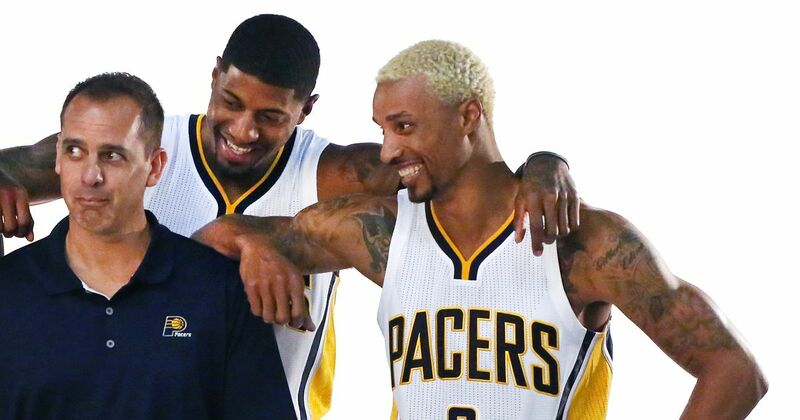 George Hill – Apparently he plans on sporting this bleach blonde dye job during the season. This is not the way to build upon your best season as a pro. I like all your kind, encouraging comments. You are a true gentleman.